Matthew 6:34 – So don’t worry about tomorrow, for tomorrow will bring its own worries. Today’s trouble is enough for today. The only time we really have is that second we call NOW! What we do with that is in our control. Choose to be present with God in the moments of your life. That’s where real living begins. We can’t live a life of the past or future but we can live NOW! 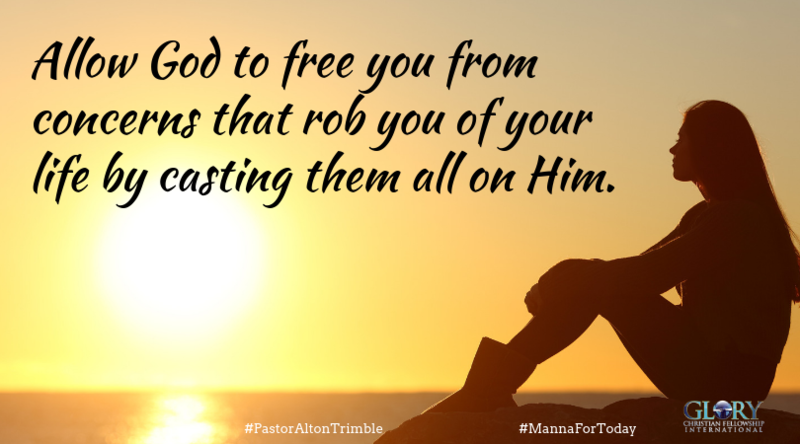 Allow God to free you from concerns that rob you of your life by casting them all on Him. Get free and live your NOW! Thank you Lord for providing us with all that we need for today… As we focus on You, you are taking care of the things that concern us! Thank you PT for the word today. This will keep me focus on GOD, what He has done and doing in my life. Regardless of what is happening in my life, job and relatives. God will bring me through it just as He has done many of times. My thoughts and focus is on the end of every situation, because He is with me every step of the way. So I focus on His victory in my life. I give all the Glory, Honor and Praise. The scripture in Isaiah 41:10 says Do not fear for I am with you. I trust your Word Father, in the name of JESUS, Amen.